"My little guy will hardly eat a meal without his BS sauce. Original and Roasted Garlic are his fav's. He's only 5 and is addicted to BS!! Thanks"
"I'm tweeting out your Facebook page to all the world. LOVING the spicy and horseradish sauces and will certainly stock up when I'm up in your area!! CONGRATS and thanks for a GREAT product!!!!" 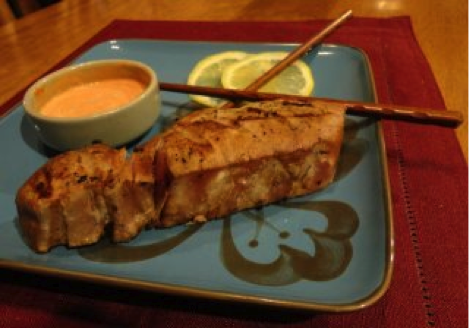 Seared Tuna from Trig's with an awesome Asian Dipping Sauce. 1 part Sriracha sauce, 1 part Kim's Spicy BBQ and one part Hidden Valley Ranch Fat-Free Dressing....AMAZING! This was our appetizer tonight! 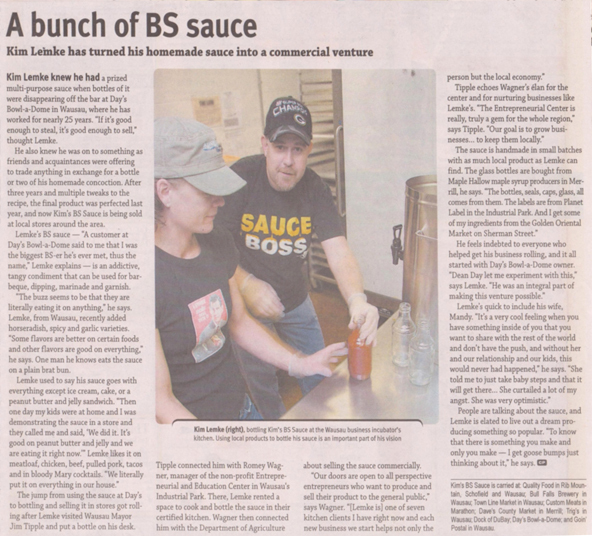 "We are fans of Kim's BS Sauce, we have been there from the beginning. Love the variety of choices he offers, and especially the food that you can add his variety of sauces to. Roasted Garlic in our BBQ & Pulled Pork...Yum!! Horesradish with tortilla chips and in our chili. Keep that BBQ sauce coming Kim. And Wausau keep BS'ing!!" Great grilling weather coming up........Need some Delicious Grilling Sauce??? Check out Kim's BS Sauce....Absolutely Amazing!!!!!!!!! I'm tweeting out your Facebook page to all the world. LOVING the spicy and horseradish sauces and will certainly stock up when I'm up in your area!! CONGRATS and thanks for a GREAT product!!! My little guy will hardly eat a meal without his BS sauce. Original and Roasted Garlic are his fav's. He's only 5 and is addicted to BS!! Thanks Kim!! We are fans of Kim's BS Sauce, we have been there from the beginning. Love the variety of choices he offers, and especially the food that you can add his variety of sauces to. Roasted Garlic in our BBQ & Pulled Pork...Yum!! Horesradish with tortilla chips and in our chili. Keep that BBQ sauce coming Kim. And Wausau keep BS'ing!! I had a taste test party for my friends in Florida, it was a huge success! No matter how they're using it....BS taste good on everything....I'm told. Keep BSing no matter where you are!!!!!!! We loved The BS Sauce..... amazing!! 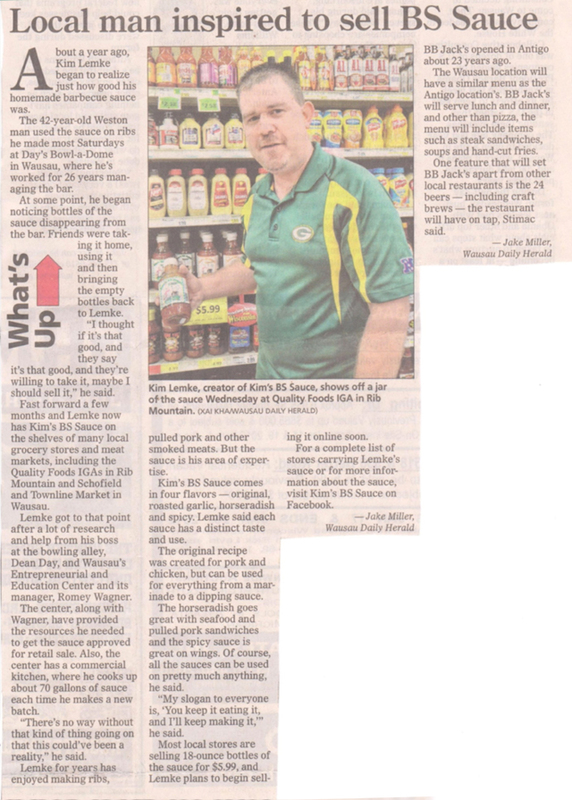 Mr. Allen was very skeptical about a sauce that wasn't from Texas, but he stated, "Kim's BS Sauce is as good as it gets."